January 24, 2019 1:10 pm. 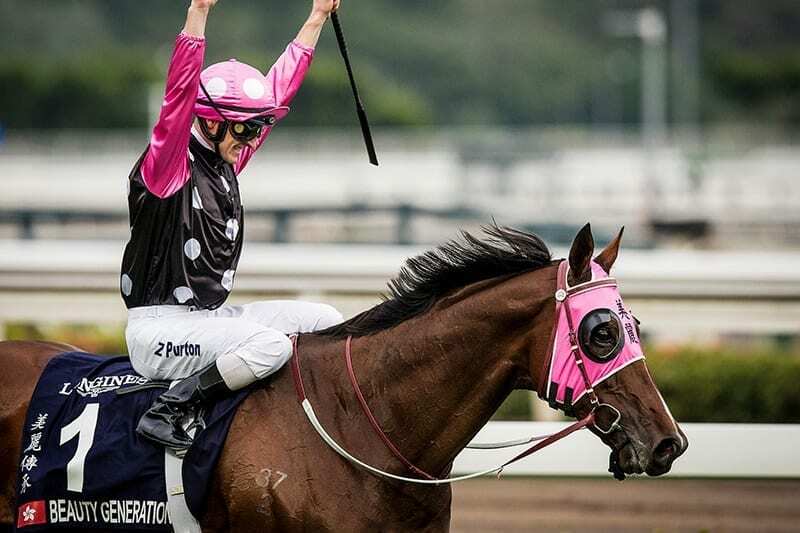 Hong Kong champion Beauty Generation is the equal “world’s best miler” alongside Australian super-mare Winx and is confirmed as Hong Kong’s joint top-rated horse of all-time with a mark of 127 in the 2018 LONGINES World’s Best Racehorse Rankings (WBRR), released today, Wednesday, 23 January. A total of 25 Hong Kong-trained gallopers feature in the list of horses rated 115 and higher. That represents 7.5% of the elite horses listed, and is Hong Kong’s second-highest total – one shy of the 26 Hong Kong horses that featured in the 2016 WBRR. Hong Kong’s champion, fresh from an imperious win in the Group 1 Stewards’ Cup (1600m) at Sha Tin on Sunday, earned his peak rating for an outstanding display in the December 2018 G1 LONGINES Hong Kong Mile (1600m) at his home track. Beauty Generation’s figure matches the rating of another Moore-trained superstar, Able Friend, who achieved his standout mark for a brilliant win in the 2014 Hong Kong Mile. Hong Kong Jockey Club Chief Executive Officer Mr. Winfried Engelbrecht-Bresges said: “Beauty Generation has further improved and has established himself firmly as the joint global Champion Miler and ranks in the world’s top five with his outstanding performances in 2018. Winx and British hero Cracksman top the WBRR, each having earned a rating of 130. Winx shares with Beauty Generation the “top miler” accolade thanks to a 127 rating earned when winning the G1 Chipping Norton Stakes (1600m). The Hong Kong Jockey Club has released a series of five 60-second videos on its social media channels to coincide with their star galloper’s high rating and to credit his excellent achievements thus far. Those videos have premiered across the Club’s social media channels this week, telling the Beauty Generation story from the perspective of the people closest to the horse: Moore; owner Patrick Kwok; the champion’s mafoo (groom); jockey Zac Purton; and Mr. Engelbrecht-Bresges. The Hong Kong Mile, the FWD Champions Mile, and the Citi Hong Kong Gold Cup are the three highest-ranked of Hong Kong’s races in the 2018 World’s Top 100 Group 1 races, also released today, Wednesday, 23 January. Eleven of Hong Kong’s 12 G1 races made the Top 100, the rankings for which are determined by the average year-end ratings of the first four finishers in each G1 contest. The aforementioned three prestigious races ranked co-29th in the list, having achieved an average rating of 119.25 in 2018. Seven Sha Tin features have made the top 50, which represents an increase of two on the previous year. The other four races to make the top half of the bracket are the Chairman’s Sprint Prize (=34), the Hong Kong Cup (=34), the Hong Kong Sprint (=42) and the Queen’s Silver Jubilee Cup (=42). The world’s highest rated G1 race in 2018, with an average of 125, was the Prix de l’Arc de Triomphe, won by the brilliant British filly Enable.